27A (MN27) car alarm & cigarette lighter & camera photo lithium batteries. 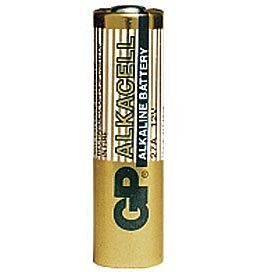 Battery equivalent to G27A MN27 GP27A A27 L828 EL812 EL-812 CA22 Bronica B-1. Type: Alkaline. Voltage: 12 V.
Price: £2.10 each. £1.90 each if you buy two or more. Postage and packing included. Also known as: G27A / MN27 / GP27A / A27 / L828 / EL812 / EL-812 / CA22 / Bronica B-1. This popular 27A small battery is commonly used to power remote controls (such as remote car alarm controls and burglar alarm remote controls) and cigarette lighters. These 27A batteries have a long shelf life. Why not buy two or more packs, take advantage of our reduced price and make sure you are not left unable to remotely control your car alarm next time your battery runs out.